Phillip Phillips Named Season 11 "American Idol"
Phillip Phillips is the new American Idol. The 21-year-old former pawn shop worker from Georgia now joins the ranks of Kelly Clarkson, Carrie Underwood, Jordin Sparks and the seven other winners from seasons past whose careers (and bank accounts) sky-rocked after winning the Fox reality contest. Sixteen-year-old powerhouse Jessica Sanchez from California was runner-up. "It's been an honor to be up on this stage performing with these guys back here," Phillips said before host Ryan Seacrest announced the winner. 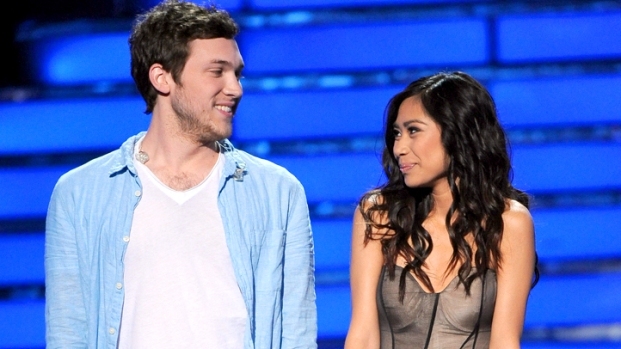 Phillip Phillips and Jessica Sanchez chat about performing their potential "Idol" singles. Jessica dishes on what the judges thought of her songs. Plus, the duo laughs about getting rejected from "America's Got Talent." The hour and 59 minutes leading up to the big reveal was peppered with live performances and an unexpected marriage proposal. Former contestant Ace Young popped the question to fellow "Idol" alum Diana DeGarmo. After some nervous laughter, she accepted. The two finalists also took the stage, giving Sanchez an opportunity to redeem herself—if not for the crown, for her own satisfaction—following a lackluster final performance Tuesday night, which may have sealed her second-place fate. She shared the stage with Jennifer Holiday to sing an impressive rendition of "And I am Telling You I'm Not Going." Rihanna, Jennifer Lopez, Aerosmith, Chaka Khan, Reba McEntire and other music industry giants also took the stage at the Nokia Theatre. But it was Phillips' final performance that was the most emotional. After learning his fate, he was handed a guitar and pushed to perform "Home," the final song he sang Tuesday night. Midway through the song, as if he finally processed what had happened, he started crying, moved away from the mic, and eventually walked off stage to embrace his family in the audience. Phillips beat out hundreds of hopefuls for the coveted recording contract that's sure to change his life.